Endorse Us – Firelands Rails to Trails, Inc. Businesses, Organizations, Civic Groups and Municipalities can support the trail by completing and submitting a Letter of Endorsement. 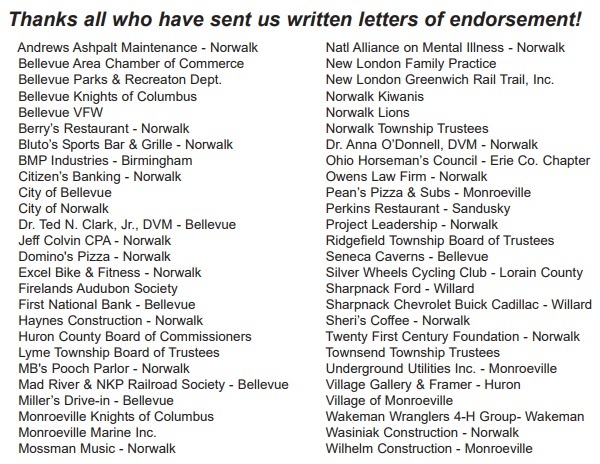 A Letter of Endorsement is just that – an actual letter endorsing and supporting the efforts of Firelands Rails to Trails, Inc. and the North Coast Inland Trail in Huron County. An LOE is not the same as a membership, as it is simply a letter of support, with no dollars attached to it, and can only be submitted by a business, organization, civic group or municipality. Those that have submitted an LOE are recognized by being listed in our trail brochure. Consider joining our growing list of trail endorsers!